PURE FLORIDA: REAL DATIL PEPPER CHAT,... NOT A RANT, ... A CHAT. REAL DATIL PEPPER CHAT,... NOT A RANT, ... A CHAT. It's been a remarkably warm fall here at PFHQ. 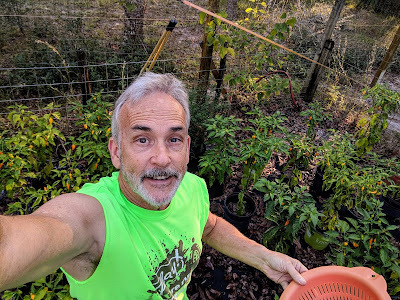 The official start of Winter is about 20 days away and I have Datil pepper plants blooming in the pepper patch! It is a fitting weird gardening end to 2018 since the Spring was remarkably cool here and it took forever for the Datils to grow and start blooming. See? That was a chat, not a rant. 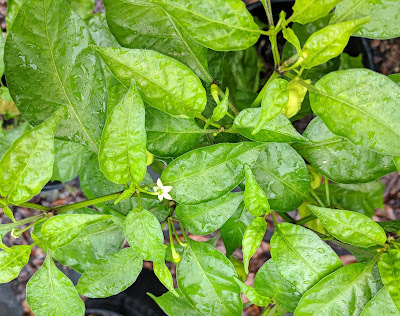 Blossoms and tiny pepperlings in North Florida on December 1, 2018. 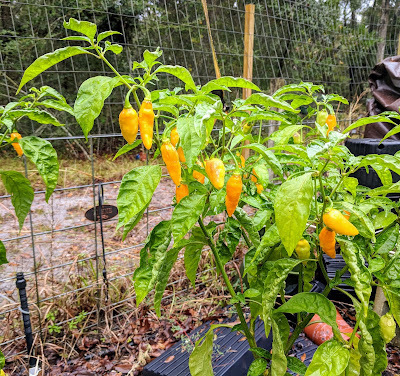 I used to be happy to still have peppers hanging in October, but unprotected plants were almost always toast by November. I picked the fully ripe peppers below this morning. They will provide the seeds for both my next planting and for the folks who buy real Datil pepper seeds from me. As I picked, a light rain was falling ahead of a cold front, but I think these plants will make it through the cold air to follow. Forecast temps are in the 30's, but we've already had two nights of near 32 F and the plants were unphased by it. Without consciously meaning to, my Grandfather, my Dad, and I may have slowly selected for cold tolerance over our 3 generations, as we saved seeds from surviving plants late in the season. Couple that with a warming climate and ALL of this year's crop may overwinter for a second round. Usually, I get one or two plants to overwinter for the second year of production, but in the past, that has involved running them in and out of the house as cold fronts slide over us. I may not have to do that this year. I grow Datil Peppers handed down from my Grandfather to my Dad and now to me. I grow them in isolation from any other type of pepper to avoid even a chance of hybridization. 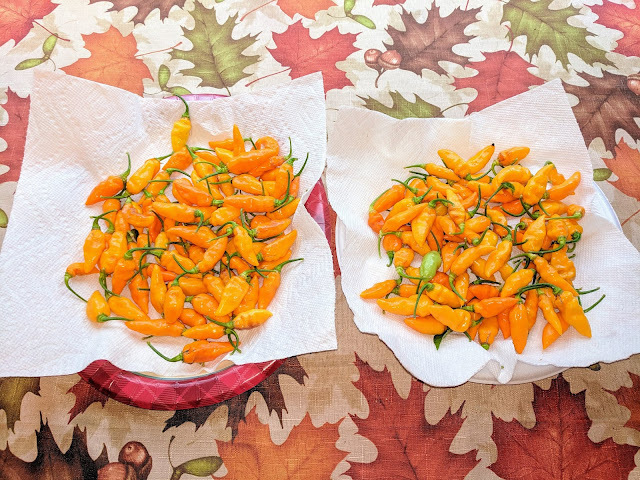 Datil Peppers are HOT, not "sweet" aka mild. Ripe Datil Peppers are orange not red when ripe. The 2 bullets above may have been a rant. You can buy REAL Datil Pepper seeds from me by clicking on the sidebar ad or the Datil Pepper seed page on this blog or you can zip over to eBAY and look for PURE FLORIDA DATIL PEPPER SEEDS. They sure are fun to grow too. I overwintered my Datil plant indoors in Minnesota, because it got off to a late start producing peppers the first year. This year I had great production. I think I ended up with 10 half pints of sauce in 3 batches. One of my best producing peppers ever! I did save the seeds.